Three classic API EQs with some welcome improvements. All are well worth the prices, though the P60G is at the bottom of our list. Delivers the sounds of the originals T-RackS CS and plugin versions included Preamp option. Separated gain and frequency controls. Overlapping bands. M/S processing. 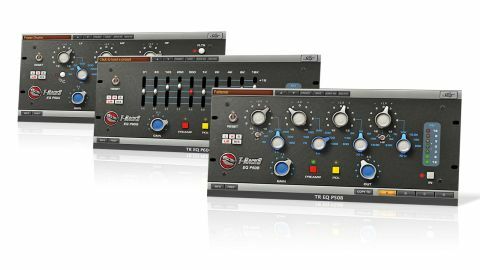 Following up the recently released Neve-style EQ73, IK Multimedia's American EQs emulate API's classic modules of the 60s. They can be used within the T-RackS CS shell or as individual plugins (VST/AU/RTAS/AAX), and are bought online or via the Custom Shop app. There are three EQs in the collection: the three-band parametric EQ P50A (emulating the 550A), four-band parametric EQ P50B (the 550B) and ten-band graphic EQ P60G (the 560). All three are visually based on the APIs, although, usefully, the gain and frequency parameters are on separate controls, and the module orientation is horizontal rather than vertical. "It sounds musical at all times... adding crack and body to snares, punch to kicks, and mid-range presence to guitars"
In keeping with the originals, the parametric EQ P50A and EQ P50B have switchable frequencies and stepped gain knobs (here in 1dB or 1.5dB steps), while the EQ P60G offers continuous gain (0.1dB resolution) and ten fixed frequency bands (31Hz to 16kHz). The gain range for all three is a modest +/-12dB, but overlapping bands enable you to achieve higher gain at the crossover points. The EQ P50A and EQ P50B include shelving and peak options for their high and low bands, while the EQ P50A features an optional band-pass filter. Each EQ also benefits from a phase inversion switch (Pol) and a Preamp option based on an unspecified contemporary API module. Activating this switches the Gain control to preamp gain rather than input level gain, increases to which gradually introduce additional subtle harmonic distortions. The EQs already impart some harmonic distortions at high gain, but the Preamp option takes things a step further. Finally, the EQ P50A includes some additional frequency settings not found on the API original. API EQs are known for their proportional Q design, whereby the Q width narrows as the gain increases; and this behaviour is present and correct across all three plugins. The best thing about the API design is that even at high gain, the Q is never too narrow, sounding musical at all times and being ideal for adding crack and body to snares, punch to kicks, and mid-range presence to guitars and vocals. With the overlapping bands of the semi-parametrics, it's also possible to achieve over 20dB of boost or cut at certain frequencies, or create broader curves by combining bands. The EQ P50A's band-pass filter, meanwhile, can help to curtail the highs and lows, although it's not particularly steep (we measured -3dB at 50Hz and 15kHz). While the graphic EQ P60G could be viewed as the runt of the litter, it does have its uses, its saving grace being the 0.1dB incremental gain, which works well for applying smooth curves to vocals, acoustic guitars, mixes and sub-mixes. On the downside, the Oversampling mode (available on a number of T-RackS plugins) is welcome but ups the CPU hit considerably - it's a shame there's no intermediate setting. Also, the Preamp is begging for optional inverse linked Gain/Output controls. But aside from that, these are great EQs, perfectly suited to additive frequency shaping, that capture the essence of the originals and throw in some great extras.